Under the Trump regime the use of abusive employment contracts has spiked, inspired no doubt, by our Liar-In-Chief's history of muzzling his employees. 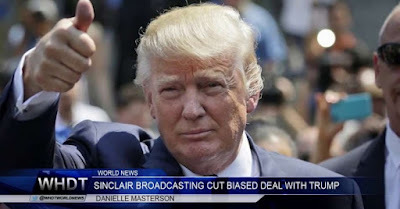 Trump who considers himself the master of None Disclosure Agreements for employees, has set the bar for companies like Sinclair Broadcasting. More corporations are taking advantage of their workers by requiring them to agree to terms entirely favorable to the company, and to the employees detriment. There's one particular company, Sinclair Broadcasting, that makes their workers sign an agreement to pay the company if they decide to leave. The contract calls it "liquidated damages," but such a claim is only legal in rare circumstances in court. More worrisome, is the clause that keeps former employees from going to competitors for a set period of time. To quickly summarize, Sinclair Broadcasting, owner of 193 local TV stations, is a right-wing media company seeking a monopoly in the media market. Social media recently was abuzz about the TV anchors in all those Sinclair stations who had to read a prearranged script from the owners. In it, there's meat for Trump followers, like claiming other news outlets are...fake news, and feature biased hacks. Which brings us back to Trump who loves Sinclair Broadcasting, and who has been the inspiration for the right wing corporate owners since he slunk into office. Sinclair TV Chairman to Trump: "We are here to deliver your message." As a retired journalist, I'm ashamed for all those news anchors who had to set aside everything they were taught in college, and act more like a parrot than a legitimate news anchor. There's no wonder Trump likes Sinclair Broadcasting. During his campaign for president, he struck a deal with Sinclair Broadcasting Group for favorable coverage - which he got, thanks to son-in-law Jared Kushner. Now Sinclair is seeking to acquire more TV stations by purchasing Tribune Media. The Federal Communications Commission (under Trump puppet Ajit Pai) has allowed the company to consolidate more power and centralize more news production. Combined with Fox News, where Trump usually gets his marching orders, Sinclair will continue to expand and praise his every move. Anyone that cares about the free press should be concerned about the direction these real fake news outlets are going. Like Fox, viewers are assured of a lot of good news about Trump, and his corrupt administration. To put it simply, it's Trump vs mainstream America. Related: Sinclair TV Host's Show canceled for tweeting sexual threat at David Hogg.